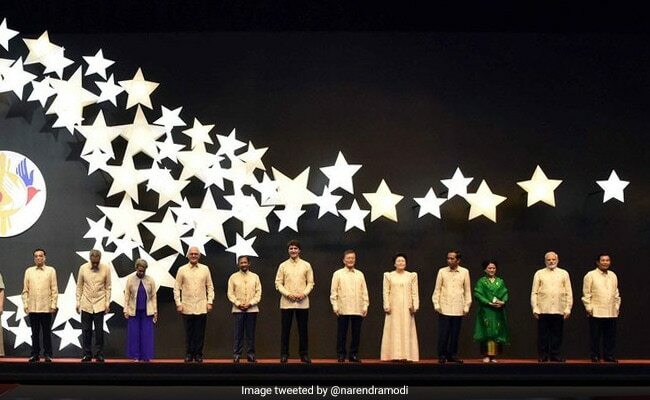 ASEAN Summit 2017: Narendra Modi tweeted this picture of him along with other world leaders in Manila. Manila: Prime Minister Narendra Modi today attended the opening ceremony of the 31st ASEAN Summit in Manila. Earlier on Sunday, PM Modi interacted with world leaders, including US President Donald Trump, Chinese Premier Li Keqiang and Russian Prime Minister Dmitry Medvedev, at a gala dinner reception hosted by Filipino President Rodrigo Duterte ahead of this year's India-ASEAN and East Asia Summits. Ahead of the summits, PM Modi will hold a bilateral meeting with Mr Duterte, and the Prime Minister is also scheduled to hold a bilateral meeting with Trump. PM Modi would also speak at the ASEAN Business and Investment Summit and attend an Indian community reception to be hosted by the Ambassador of India to the Philippines.